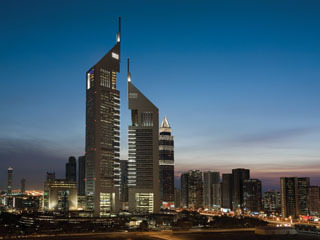 Grand Hyatt Dubai offers a first for a Dubai hotel - the concept of a city resort which includes first-class recreational facilities, yet the hotel is situated close to the city centre and just minutes from Dubai International Airport. Located in the Gulf's most exciting city on the south bank of the Creek just off Bur Dubai, the emirate's financial and trade district. Close to the Dubai Creek Golf and Yacht Club and five minutes from the Central Creek area. 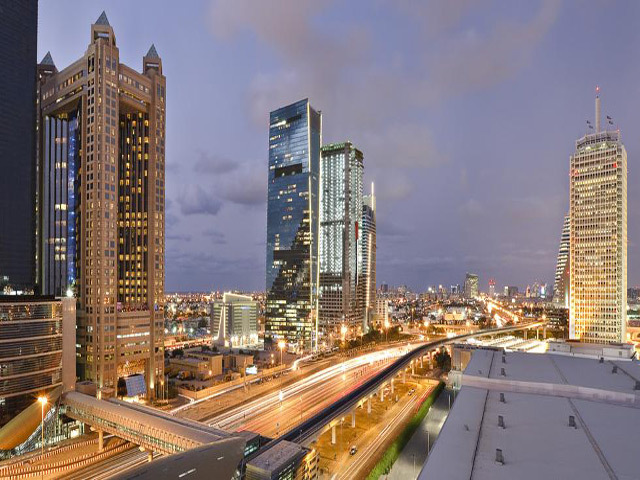 Dubai International Airport / Dubai Airport Expo is only ten minutes' drive, Dubai World Trade Centre is just five minutes by car and Jebel Ali Freezone is 20 minutes. 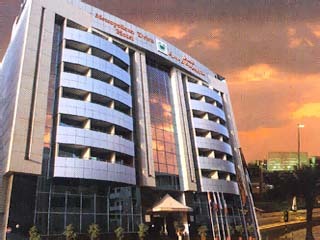 Shopping and the Business Centre are both a five-minute drive from the hotel. The multilingual Concierge will be pleased to help with any ground transfers and will also provide Arab language instructions on guests' behalf. Relax in a spacious 66-m² room offering Arabian touches and stunning views of Dubai's historic creek and parklands. Luxury amenities include one king bed, marble bath with tub, shower and bidet, work area with high-speed Internet access. Includes Grand Club privileges with access to a private lounge serving Continental breakfast, evening cocktails and hors d'oeuvres. Relax in a spacious 88-m² room offering Arabian touches and stunning views of Dubai's historic creek and parklands. Luxury amenities include one king bed, marble bath with tub, shower and bidet, work area with high-speed Internet access and complimentary mini bar. Includes Grand Club privileges with access to a private lounge serving Continental breakfast, evening cocktails and hors d'oeuvres. Enjoy an exclusive 132-m² suite offering Arabian touches and skyline or creek views. Luxury amenities include king bed, sitting area, kitchenette, large work area with high-speed Internet, guest bath, and marble master bath with tub, walk-in shower and bidet and complimentary mini bar. Includes Grand Club privileges with access to a private lounge serving Continental breakfast, evening cocktails and hors d'oeuvres. Panoramic views of Dubai's historic creek welcome you to 176m² upper-floor suite offering bedroom with plush king-size bed, elegant sitting area, kitchen, guest bath, work area with high-speed Internet, and marble bath with jetted spa tub, shower and bidet, Butler service on request and complimentary mini bar. Includes Grand Club privileges with access to a private lounge serving Continental breakfast, evening cocktails and hors d'oeuvres. Panoramic views of Dubai's historic creek welcome you to a 264m² two-bedroom suite offering one king and two single beds, spacious parlor, dining for eight, kitchenette, wet bar, work area with high-speed Internet, and marble bath with jetted spa tub and shower, Butler service on request, complimentary mini bar. Includes Grand Club privileges with access to a private lounge serving Continental breakfast, evening cocktails and hors d'oeuvres. Dubai offers a vast array of activities including shopping, golf, horse races, yachting, and museums. 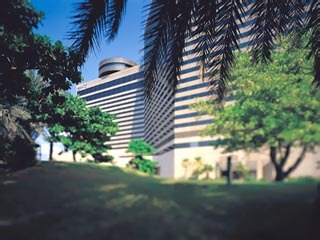 Within the hotel there is a health center & spa, shopping arcade, swimming pool, tennis, and sightseeing tours. 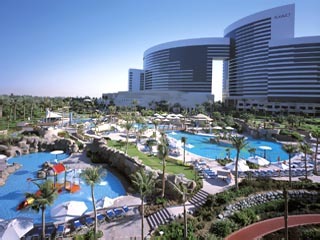 Grand Hyatt Dubai sets itself apart with its range of resort facilities all set within 37 acres of perfectly-landscaped gardens where winding pathways lead past cascading waterfalls and tropical lagoons, towards the hotel's spectacular pool area. Within the hotel, 14 restaurants, bars and cafes offer an array of cuisines as diverse as it is authentic from Lebanese, Italian, Singaporean, Vietnamese, Japanese or American Grill, with most of the hotel restaurants featuring open kitchens and al fresco dining terraces. Indulge in authentic Indian tandoor dishes, prepared and served at live open cooking counters, including a selection of fresh fish and seafood, poultry, meat and vegetarian options, in a casual and chic atmosphere. Sushi is found in Grand Hyatt Dubai’s lush Atrium, offering sushi and sashimi in tranquil surroundings, prepared live by our sushi chefs.